The output video exe only can play video that windows media player can play. The effect is same as window media player. If your end user cannot play the video correctly, maybe he does not install corresponding Codec. 1. Convert you video to another format that all windows media player version can play, such as ASF,WMV, etc. The effect and quality is good enough. In this case, your end users need not install any codec, it is inside in window media player already. 2. Ask you end users install certain codec that can let windows media player play your video format. If you do not know which codec is, you can recommend your end user download the Free K-Lite Mega Codec Pack it support most of video formats. 3. You can visit www.videotoexe.com, the product in this website can convert a video to exe that does not require your end user install any Codec. You can try it. How to convert video file to EXE file? How to set the registration key for the output EXE file? How to generate the registration key? What does product id mean? How large video file can you support? Can I add Digital Signatures into output video exe? My end user are not english man, Do you have any other language version? I do not like your original message, for example I like change 'registration key' to 'password'. How can I do that? I want to make a full protected video exe, and there is no limit, no registration need for end user. Everyone can play the video. How can I do that? I want to make a trial version, it should has time limit. If the end user want to get full version, I send the full version video exe to him. How can I do that? I want to make a protected video exe, only permited person can play the video. How can I do it? I want to make a trial version, it should has some play time limit. 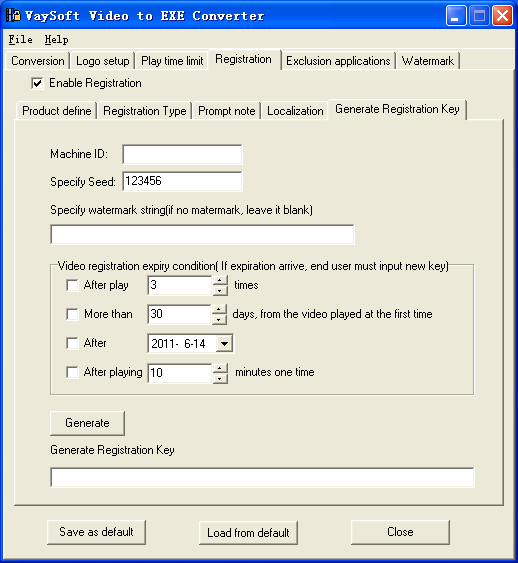 If the end user wants to continue to play video , he must ask a new key, I can decide if he can play video again with some limit or without any limit. I will send the key to him. If he input the key correctly, he can play video again with some limit or without any limit. How can I do that? Can I add a button in 'Please enter Registration key' dialog, when end user click the button, my website will open? How to convert video file to EXE file ? 1) Click the right button of “Add File” to select the video file you want convert. 2) Click the right button of “Executable output folder ” to specify the path which the EXE file outputs. 3) You can personalized your EXE file by “option”. Give the name of your video or write operation tips, define the size of the video player window, and so on. 1) Setup the logo of the output EXE file. 2) Specify the images and the effects of the images before and after playing the video. 1)Set "video expiry condition", you can choose one or multi conditions at one time. 2)Decide "If expiry condition arrives", what will be done in the next step. when you want a website or a message appear, tape the website and the message. 1) Select “Registration Type” bar, define the registration type. 2) Select “Prompt note” bar, edit the prompt of registration. 3) Select “Localization” bar, edit the items of the registration dialog. 5. Select the “conversion” bar, click the button “convert”, after the conversion, you can click the button “preview” to preview the converted EXE file. Reference the picture on the right. 1. Select the “Registration” bar and then click the left side checkbox of “Enable Registration”. 1) Click “Product define ” bar and select product combinations. what does product define mean? please see details. 1. after you finish the set, you can click the button "save as default" to save the set as default. 2. when you want to set the same Product define, click the button "load from default", the saved type will load. 1) Select “Registration Type” bar. 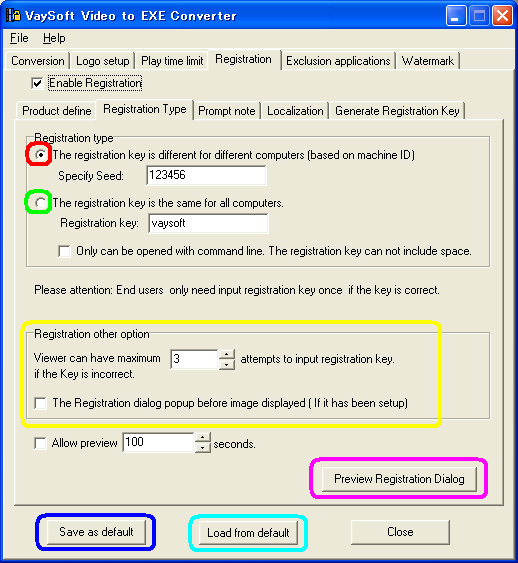 2) If you want to set different registration key for different computer. ● Click the left side checkbox with the red circle mark. ● Fill numbers or letters as you like in “Special Seed”, and remember them, you will use them again when you generate the registration key for your users. 3) If you want to set the same registration key for every computer. ● Click the left side box with the green circle mark. 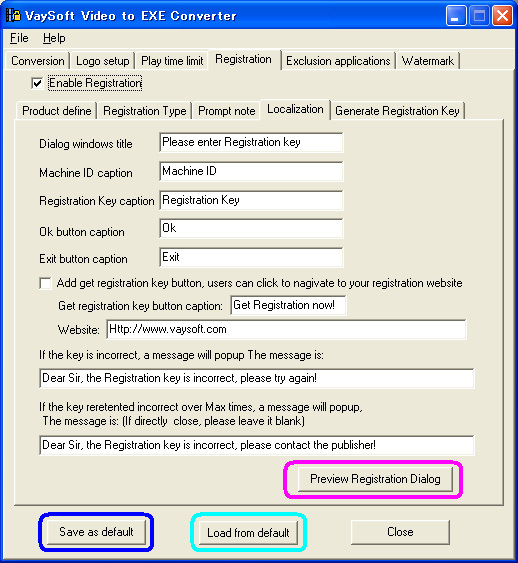 ● Fill numbers or letters as registration key in “Registration key”. 4) Edit “Registration other option” with the yellow circle mark, you can edit them easily. 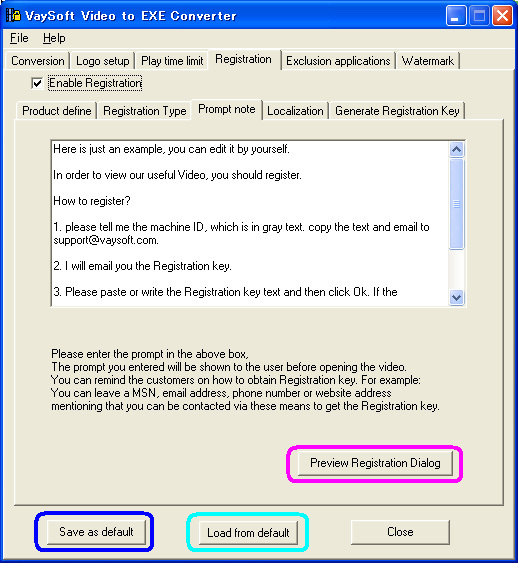 1. you can priview the registration dialog by click the button with the pink circle. 2. after you finish the set, you can click the button "save as default" to save the set as default. when you want to set the same registration type, click the button "load from default", the saved type will load. Select “Prompt note” bar, edit the prompt message in the box of registration. 1. you can preview the registration dialog by click the button with the pink circle. 2. after you finish the set , you can click the button "save as default" to save the set as default. when you want to set the same prompt note, click the button "load from default", the saved prompt note will load. Select “Localization” bar, edit the items of the registration dialog. when you want to set the same registration dialog, click the button "load from default", the saved item sets will load. Select “generate registration key” bar. 1. copy or type the machine ID of the user. 2. type the "Special Seed" which you setted. 3. If you want to add watermark you can input, otherwise, just leave it blank. 4. Check on the time limit you want. 5. click the "Generate" button, a key will appear, copy the key and send it to your user. After you finish type the "Specify Seed", you can click the button "save as default" to save the set as default. when you want to set the same Seed, click the button "load from default", the saved Seed will load. What does the product define mean? 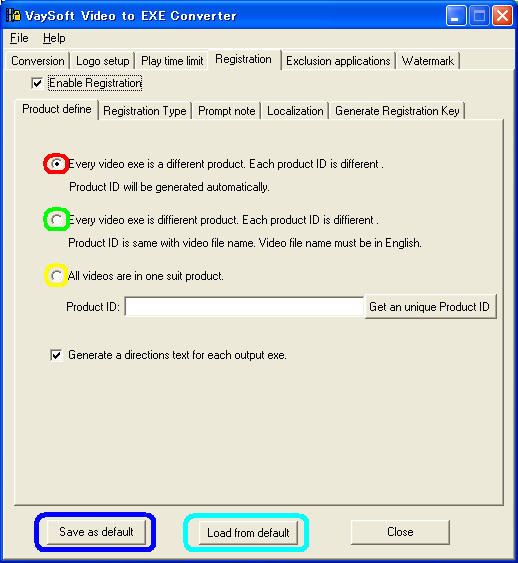 When you convert a video to exe with registration enabled, the output exe has a product id. if the output exes product id are same, it means the output exe is in a suit. if your uses input correct registration keyany in one exe, the other exes will not need input registration key again. If you video file is smaller than 2G, it will work ok after convert to exe. There is no converter in any other language except English. but you can generate out video exe whit other language . Almost all message in output exe can be redifine, button caption in localzation tab can also setup. If you think its original message or information is not acceptable, you can change it as you like even with any other language of your own. Almost all message in output exe can be redifine, if you think its original message or information is not acceptable, you can change it as you like. In your case, you can change 'registration key to 'password' in Localization tab. You can just check off 'Enable time limit' in Play time limit tab, check off '"Enable Registration' in Registration tab and then convert. The output exe is what you want. In your case, firstly you can check on 'Enable time limit' in Play time limit tab, check off '"Enable Registration' in Registration tab, check on 'Add a try button' and then convert. The output exe is trial version video exe. Secondly, you can check off 'Enable time limit' in Play time limit tab, check on '"Enable Registration' in Registration tab and then convert. The output exe is full version video exe. After he input correct registration key, he can play the video in certation computer. You can check off 'Enable time limit' in Play time limit tab, check on '"Enable Registration' in Registration tab and then convert. The output exe is what you want. You can check on 'Enable time limit' in Play time limit tab, check on '"Enable Registration' in Registration tab and then convert. check on 'Add a try button' in Localization tab. The output exe is what you want. You can check on ' Add get registration key'.